During this 90-minute live interactive workshop, you will get all of the tools and step-by-step instructions to create a highly effective and impactful Board of Directors. You know that you need an active and engaged Board of Directors, but you are not sure how to create one. Well, you are not alone. There are hundreds of thousands of nonprofits both big and small that have a lackluster Board of Directors. You know the kind. They just show up for meetings and then leave. Or they recruit all of the “warm bodies” in town to become Board members. Your presenter, Robin L. Cabral, MA, CFRE, is on a mission to create high performing nonprofits from the foundation up, starting with a strong and effective Board of Directors. 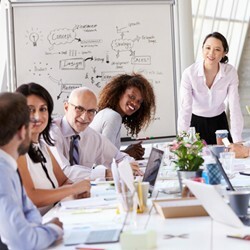 having the right mix of skills and diversity on your Board to move your mission forward. knowing that all of your Board members have been rigorously screened and are ready, willing, and able to become engaged in their work. attending the perfect Board meeting that starts and ends on time covering all the key topics to move your organization into the future. maximizing your Board’s performance by regularly assessing and holding Board members accountable to established expectations. As a long-time fundraising expert, Robin understands the importance of Board governance to the overall effectiveness of an organization, including fund development. With over twenty years of experience, she teaches the exact steps that she has used to transform organization’s Board of Directors from lifeless to lively and from management to governance creating high-performing organizations and meaningful board engagement. Robin is an active member of the Association of Fundraising Professionals (AFP) and adheres to the AFP Code of Ethical Principles and Standards of Professional Practice. She has served on the National Catholic Development Conference Planning Committee and the Professional Development Committee; she was on the board of AFP-RI, has been a conference presenter, workshop leader, roundtable leader, moderator, and facilitator, and was a recent AFP-RI Conference Planning Committee Co-Chair. She is also an AFP Master Faculty Trainer and has served on the AFP International Education and Training Committee.